On Thursday night October 9, 2008, I was in the family room with the TV on and working on my laptop. All of a sudden I heard this loud "BROINGGGG" sound. When I looked up, the TV picture was all posterized (smeared and off-color). To make a long story short, after calling Samsung and a local TV repairman, it was determined that our color wheel had shattered. Not surprising, as it spins at 9000 RPM!! The TV is two and a half years old, and, of course, out of warranty. The total repair cost was estimated at about $350. (service call(s) + parts + labor). I did some searching on the Net and found a 5-part YouTube video showing the color wheel removal and replacement in great step-by-step detail. 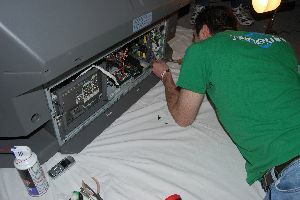 So, my son, Joe, and I decided we could tackle the repair ourselves, if we could find the part. Again, to make a long story short, I found it in stock at: Audio Lab of Georgia for $117. (including shipping). The new color wheel arrived on Thursday, October 16th, and Joe and I scheduled the repair for Friday, Oct. 17th. The slide show documents our removal and replacement of the color wheel, which went quite smoothly and was very successful. The actual work took us about an hour and a half.